Welcome back! Has anyone visited the Learn All About Horses Website since I have been revamping it? Your input would be greatly appreciated. Also, if I have overlooked any non-functional or mis-guided links, please let me know. Summer is horseshow season and calf branding time for us. Keep us very busy. If you've haven't read my story "Calving Heifers," you might check it out for a laugh or two. It is just one of the interesting and fun stuff we try to provide for you. Our featured website this month is Horse and History or A Dog May Be Man's Best Friend, but it was the Horse That Built Civilization! This website consists of an interesting and informative essay on the impact of the horse on human history! A must read! Traditionally, horses are tacked from the left side; however a well-trained horse will accept saddle and blanket from either side. Which is the horse's left side? Face the same direction as the horse; your left side is his left side. Over the months I have followed these newsletters with interest. I just read the profile Barbara did on herself, however it is very incomplete. May I take the time to do a profile on this remarkable lady. I have known Barbara for 47 years, actually since the day she was born. There are a few things I would like to tell you that she will never write in a profile. She not only has loved horses since she was old enough to say horse, but she has also helped raise many troubled kids. It seems that in the past 20 years everytime I have been to her home there are one or more extra teens living with her family. These are kids who have had problems in their own homes and somehow found Barbara. As all of you can tell she is very proud of her new colt Shade, BUT what you don't know is she was willing to give up that colt for a little girl who had lost her mare. I am sure you have all read about Peppi and Eclipse. 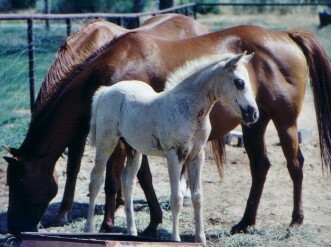 I sold Peppi to Holly and kept Eclipse(her foal). When Peppi died Holly was devastated. Barbara called me and offered to give me Diamonds foal if I would let Holly have Eclipse. She felt Eclipse would be the only thing to console Holly. Holly has Eclipse and Barbara still has her foal although I claim 1/2, which is a formality, as I will never take that foal. I just wanted the readers to know what a special person this lady is. If this letter is not published I can guarantee retribution as she is still my baby sister. I thought this month I'd introduce you to me. In this picture, Diamond and I are in Vermont. Diamond is the mother of Shade, the palomino baby I keep bragging about. Shade was born April 14, 2002. Some of my earliest memories are centered around horses. In fact, I can't remember a time that I didn't have a horse. I have been training, showing, and teaching riding lessons for 18 years. And now I have added writing about horses and horsemanship to my list of horse-related activities. CountryMall Gifts and Decor----Gifts that say I Love You.